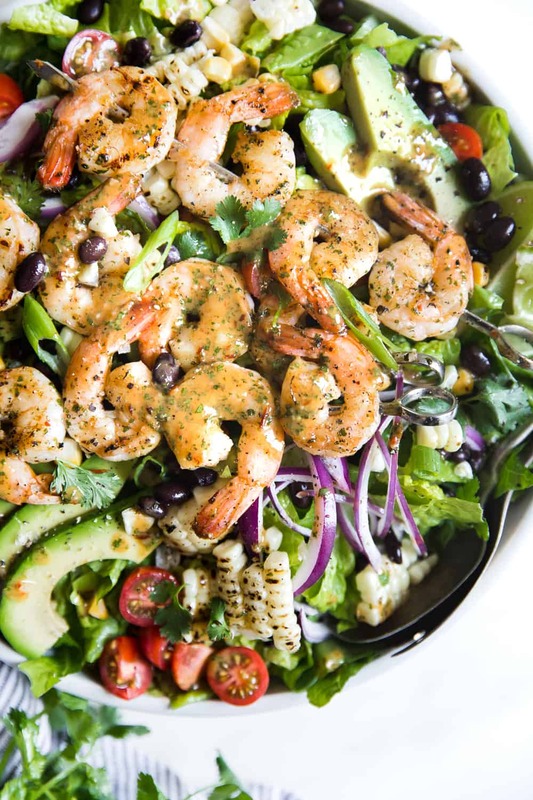 This easy Grilled Shrimp Salad recipe is the perfect solution to your summer dinner needs! It’s healthy, quick and full of grilled chipotle flavor. 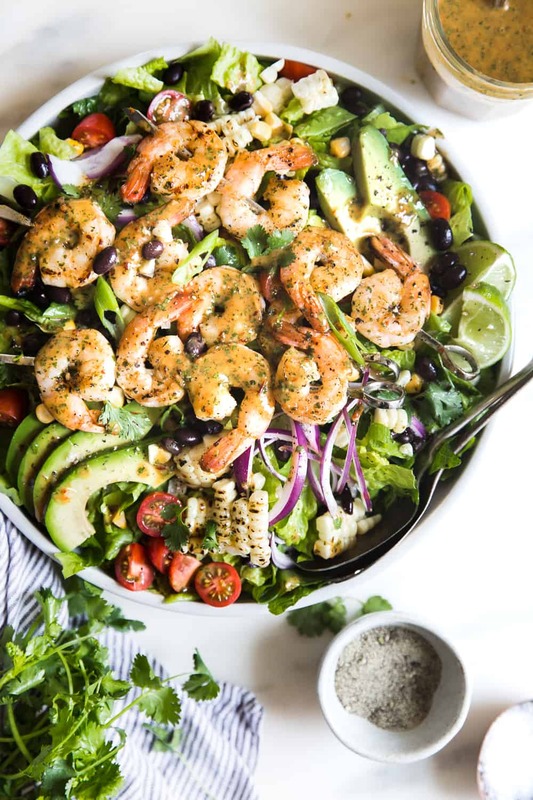 Hi there, it’s Holly from The Modern Proper, back again with a delicious grilled shrimp salad that makes for the perfect dinner during the warm summer months. I love how quick and easy this dish comes together and that it is so full of flavor. I also love that it uses my grill, so my house stays cool and clean up is a breeze. I am always looking for those perfect go-to recipe this time of year. You know, recipes that are family friendly, can be quickly cooked on the grill, and that come together in a flash? 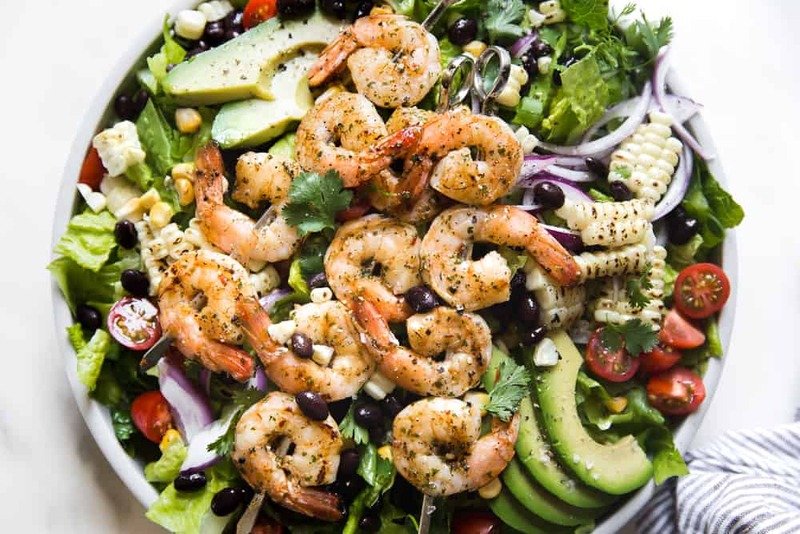 Well, thankfully this grilled chipotle shrimp salad recipe meets all those requirements and more. For this dish I prepped all of my chopped ingredients and the dressing ahead of time which was a real time saver come dinner time. All I had to do was throw the corn on the grill, marinate the shrimp in some of the dressing and then add them to the grill, too. I tossed my salad and all chopped and grilled ingredients in a large bowl and I was ready to serve! I love it when a salad is hearty enough to be a complete meal and no extra sides or dishes are required. It makes my life so much easier! Can we take a moment and just talk about this dressing? I have to say, this may just be my favorite new dressing for ALL salads, but it works with the grilled shrimp especially well. The lime and cilantro pair so perfectly with the corn and black beans, too. Add some avocado and well, you’ve just put this dish over the top. If you, like me, are spending a lot of time at the grill this summer, let me suggest a few more delicious salads that make great one dish dinners. Add all the ingredients to a medium sized glass jar. Using a immersion blender, blend until combined. Alternatively, you can use a stand blender for this step. Set dressing aside. 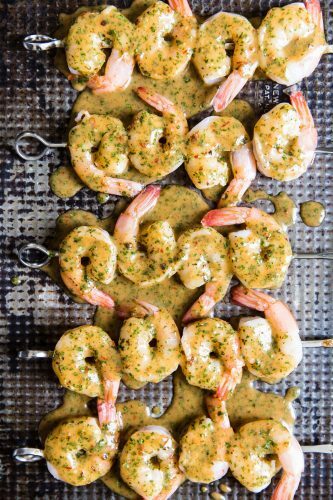 Marinate the shrimp in a bowl with ¼ cup of the dressing for 15 minutes. Thread the shrimp onto metal skewers. Lay the shrimp and corn cobs on the hot grill and cook until cooked through (the flesh of the shrimp will turn opaque) and grill marks form, about 2 minutes per side. Rotate the corn a few times during this time. Remove both and set aside. To prepare the salad, add the lettuce, black beans, avocado, corn, onion and tomatoes to the bowl with the dressing. Toss to coat well, then transfer to a serving bowl or platter. 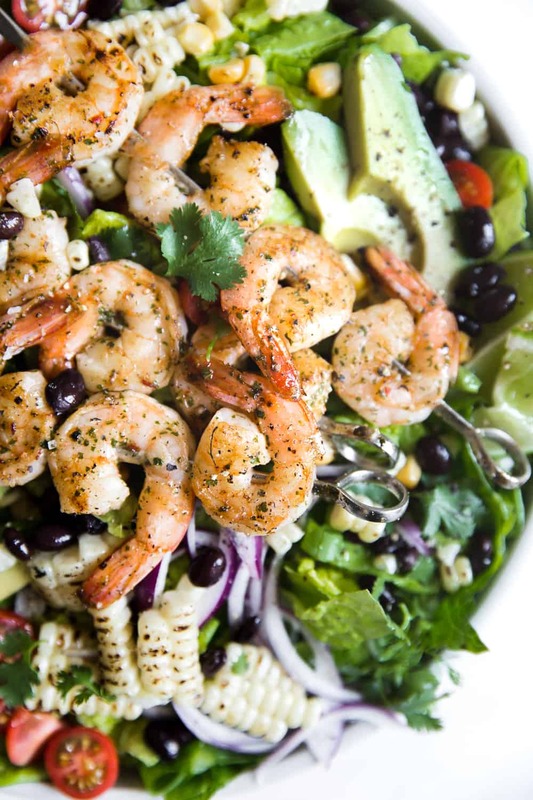 Top the salad with the shrimp and serve. This recipe looks wonderful! But where are the reviews for it?? 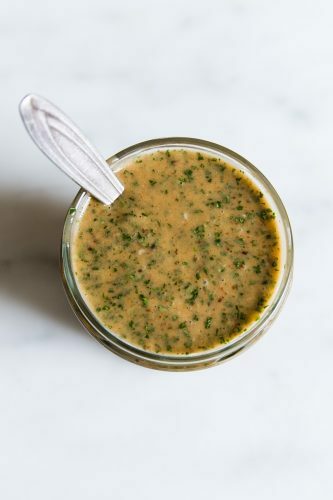 The dressing is awesome and can be used on many other dishes! Great flavor and made for a very satisfy dinner!! I made this for a spring dinner last night, using my indoor Lodge cast iron grill for the shrimp & corn (frozen; couldn’t get good fresh). It was delicious, and quite successful with my somewhat picky husband and dieting friend. I agree, dressing recipe could be used in lots of ways. My only quibble: the picture shows olives, which are not in the recipe but I think would go well. Oops, forgot to mention, we ate with tortilla chips on the side.